The Automotive Filters Team of Freudenberg Filtration Technologies has been recognized twice for their supplier quality, service and support regarding its micronAir cabin air filter. On June 26th, Freudenberg’s Team Europe received the Groupe PSA Supplier Award in the category “Aftermarket Performance” for their exceptional performance in terms of quality, service and cost savings for OES / spare parts. 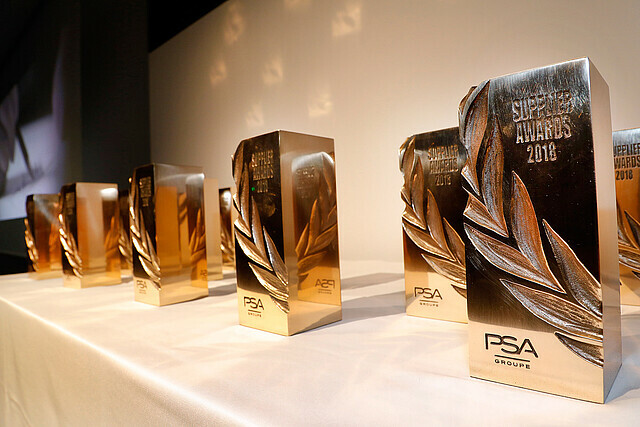 The Groupe PSA’s Supplier Awards 2018 were presented in Poissy, France, for the 14th time. On the other side of the Atlantic, Freudenberg’s Team in North America was awarded the 2018 Honda Supplier Performance Award in Toronto, Canada – for the sixth time in a row. The Groupe PSA’s award in “Aftermarket Performance” was presented to Freudenberg Filtration Technologies in honor of the supplier’s commitment and performance in 2017 and its ability to meet the French automobile manufacturers quality requirements and demands on supplies. PSA praised the cabin air filter specialist for its support and flexibility in planning. “We are honored that our company is considered as a top supplier in all aspects by PSA,” says Barry Kellar, Global Vice President Automotive Filters at Freudenberg Filtration Technologies. “In our daily work, we aspire towards excellence – to the benefit of our customers and their consumers. We are very proud to receive this award in recognition of our efforts.” Freudenberg Filtration Technologies supplies PSA with different cabin air filters, such as the micronAir particle filter, and combi filter as well as the latest generation of allergen and fine dust filters.